Girls soccer team at PS 125 receives instruction and support from their coach and Principal Higgins during a fall 2015 game day. West Harlem Development Corporation’s impact in the community can best be seen in the changes that have taken place in the schools. 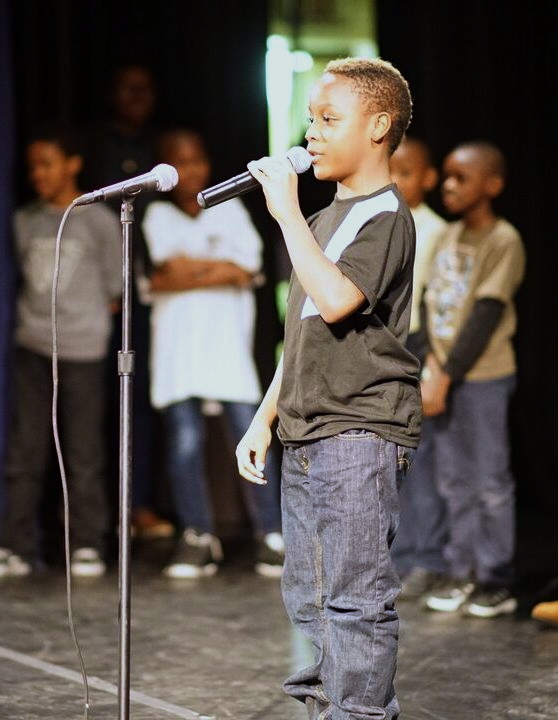 Jalen performing his original poem “The Life of Bullying” at the 2015 America SCORES Community Poetry SLAM in November 2015. One school in particular, P.S. 125 Ralph Bunche, has uniquely benefitted from WHDC-funded programming due to the school’s proactive and welcoming principal, Reginald Higgins. Principal Higgins was introduced to several WHDC grantees at a public meeting held by WHDC, and has since signed several of the groups on to conduct in school and after school programming. He was also the pilot school for a WHDC-funded attendance app, Kinvolved, which increases attendance and parent engagement. Since Mr. Higgins began as principal in 2011, and later engaged with WHDC-funded programming, the percentage of children passing state standardized tests increased by more than 84 percent. Sixty percent of Mr. Higgins’ third graders passed the English Language Arts section of the standardized tests while only 16 percent of students in the same school district, District 5, passed. Additionally, Kinvolved greatly improved attendance and parent engagement at P.S. 125 as part of an 8 percent gain in average daily attendance at all District 5 schools. P.S. 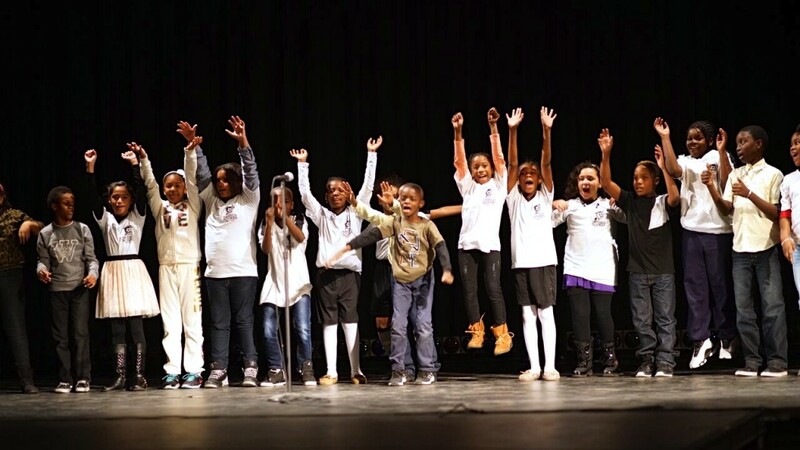 125 girls and boys soccer teams performing their school poem at the 2015 America SCORES Community Poetry SLAM in November 2015. 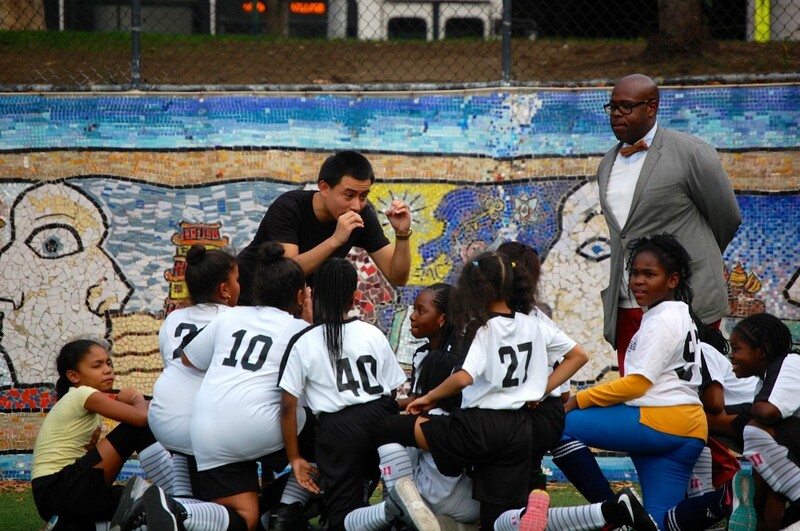 Center: Girls soccer team at PS 125 receives instruction and support from their coach and Principal Higgins during a fall 2015 game day.